It was a beautiful day in Dallas for Traffic Skills 101, by the League of American Bicyclists! Yes, it was kinda cold. Yes, the North wind was blowing. But this class was originally scheduled for last Sunday when it SNOWED! So it was a beautiful day in Dallas! There were eight students in the class, and the ratio of instructors to students was amazing! The class included 4 hours of online instruction before the "hands on" drills. 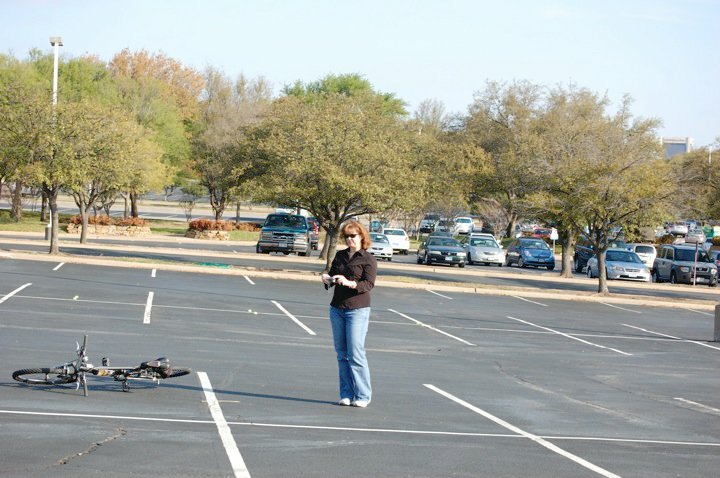 About half the time today was drills in the parking lot, the other half was on the streets of Dallas. 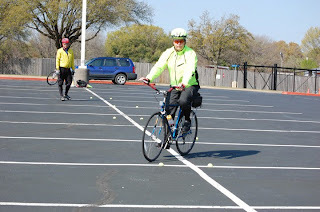 In this picture, I am riding my bike in a zig zag pattern (a pretty tight pattern), just to get used to some tight turns, and getting a feel for how your bike handles. One of the drills was to scan back over your shoulder, as if you were checking for upcoming cars to change lanes or make a turn, while maintaining a straight course with your bicycle. Try it, it is harder than it looks! 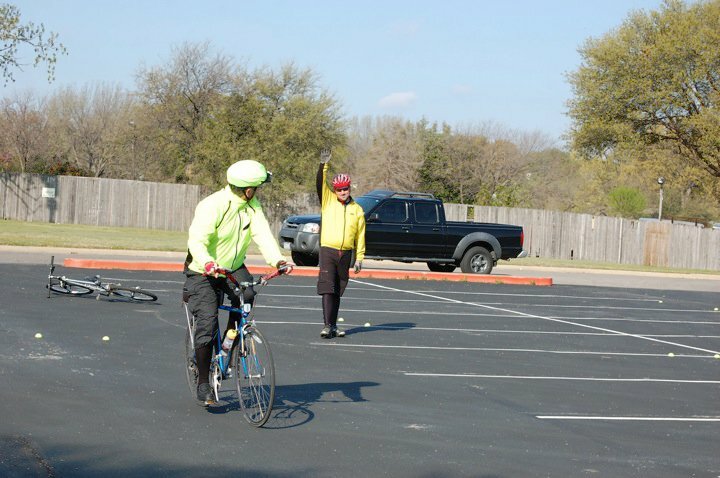 The person in the background would hold up one or two arms, and the cyclist had to scan, maintain his position, and call out how many arms were in the air. This picture is of Tim and George and me. 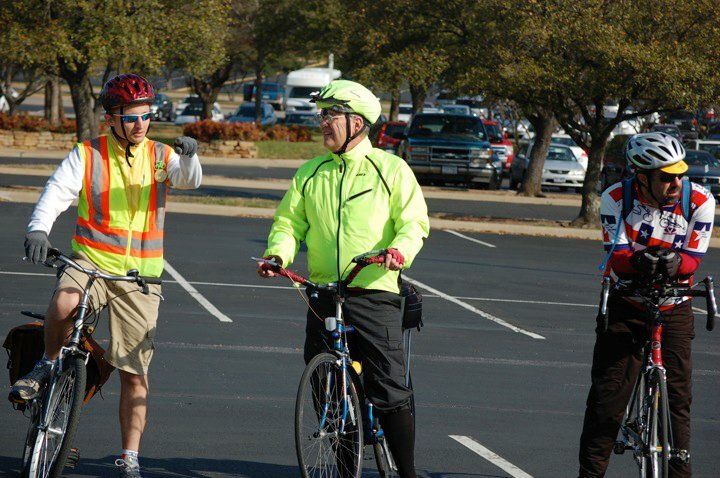 Tim works for the City of Arlington and commutes to work like I do. 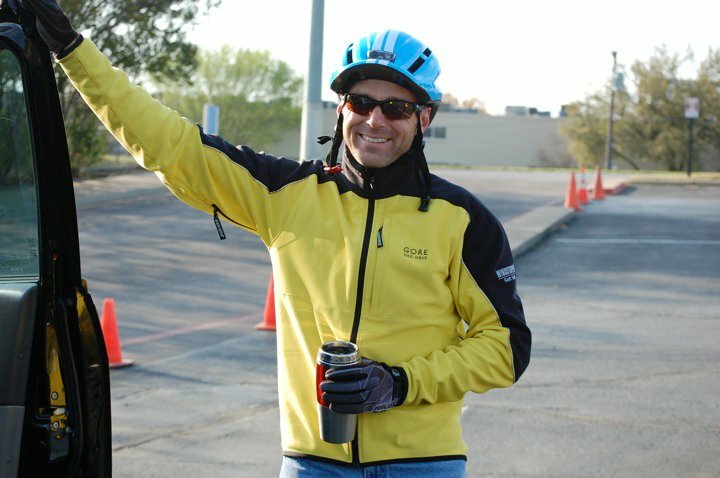 George also commutes to work and is a member of the Lone Star Cyclist that sponsor the Tour de Italia in Italy, Texas each June. The Tour de Italia was the first bicycle rally Rhonda and I rode in 2006, and George was in charge of it that year. It's a small world, isn't it? This picture shows George in the "Quick Stop" drill. We slammed on the rear brakes, then the front and rear brakes together, then the front and rear brakes together AND slid back off the saddle. It was amazing to learn how much quicker one could stop a bicycle in an emergency! 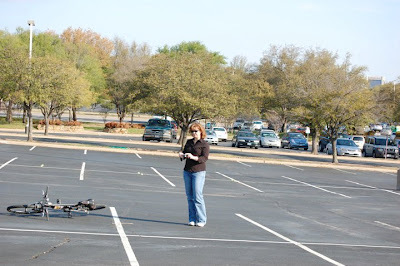 Notice how attentive the instructors were, making sure we were safe performing this difficult manuever! This is not particularly good photography (they missed my face! ), but it certainly shows the intensity and seriousness of this drill. I'm a pretty happy guy, and I like to smile for my photos, but this was obviously pretty important! 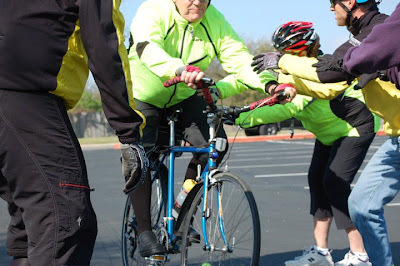 I'm really appreciative of the League Cycling Instructors that put so much time and effort into teaching these skills to knucleheads like me! These two photos are of Richard Wharton and Sherry Lewis, two League Cycling Instructors that were SO helpful. I hope to be a League Cycling Instructor when I grow up. 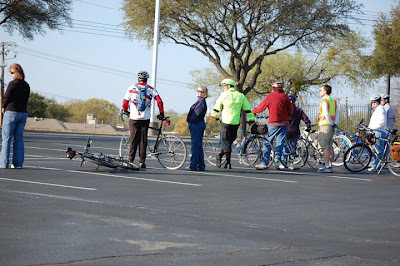 After the parking lot drills, we got really practical, and rode several miles around Dallas, on six lane roads, making lane changes in traffic, moving from the right lane to the left turn bay to make left turns and just generally being "traffic". It was a bicycle confidence inspiring day! Rhonda was there, too! She drove me and my commuter bike up there, then spent the day shopping and having lunch with our son T.J. and his wife Kristina. She hung around and took pictures for a while when we were getting started, and I am so thankful to Gail Spann for getting a picture of her! There are several more pictures of this class on my Facebook page, courtesy of a really sweet and beautiful lady I'm so glad to have as my new friend, Gail Spann. 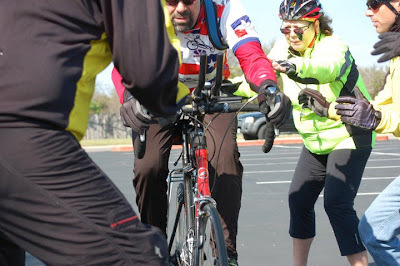 Gail is a League Cycling Instructor and is in the picture of me showing how to stop really fast! She was going to catch me if I fell over. (Yeah, right!) YOU are not too old, or too out of shape, or too anything else to ride a bike. 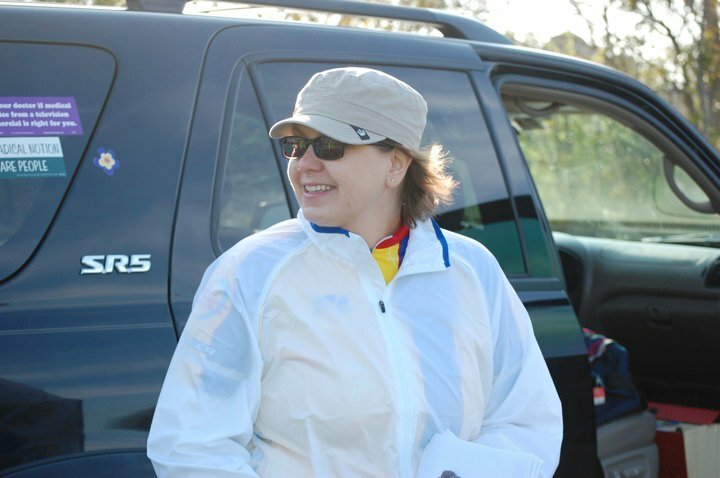 I ride every day, I absolutely love it, and I want you to come join me! It will make a kid out of you, again! "I hope to be a League Cycling Instructor when I grow up." It is AMAZING what one runs across on the Internet nowadays! Did you manage to dodge all those rocks in the drills? this is my first visit to your blog and i am liking it!